Contact the zip code referral that best suites your needs, and they will be happy to assist you. With the high percentage of mothers with children under the age of five needing or choosing to work outside the home, quality child care has become an issue of growing importance and concern. Whether you are currently using a child care facility or are among those parents who are searching for a nurturing environment for your child, we would like to present you with information to help you in your decision of choosing a quality provider and child care home. Why a Licensed Child Care Home? A provider who has taken the effort to become licensed has an obvious dedication to long term child care and to offering a dependable secure environment for your child. All licensed providers have taken 15 hours of Pre-licensing training. All licensed providers have a minimum continuing 15 hours training yearly. All licensed providers must have certification in both Child CPR/and First Aid. All licensed providers must have taken a minimum 4 hour Medication training. All licensed providers must have taken Universal Precautions training. All licensed providers must have been screened against any prior or current convictions of child abuse or neglect. Licensed homes must meet the Minimum Rules and Regulations for Day Care Homes set by the Colorado Department of Human Services which include: Health and Safety Standards, Appropriate supplies and equipment, and adequate space for children. Licensed homes are inspected routinely to ensure licensing standards are being maintained. Licensed providers can participate in a Child Care Food Program sponsored by the USDA, which ensures your child is eating highly nutritious and well balanced meals and snacks. Support systems are available to EDUCATE and MOTIVATE licensed providers. Why NOT an UNLICENSED Home? UNLICENSED CHILD CARE (care for children from more than one (1) family) is ILLEGAL IN THE STATE OF COLORADO (per Article 7.701.B,State Department Of Human Services). A person may care for a child/ren from ONE FAMILY only without being licensed. If there are children from more than one family in care at an unlicensed home THE PROVIDER IS RUNNING AN ILLEGAL OPERATION. With the increased awareness of the public concerning quality child care, more and more reports of unlicensed care are being reported. Upon a visit from HUMAN SERVICES, the unlicensed provider could be fined, along with the order to cease and desistchild care THAT DAY. This offers a potentially unstable environment for your child and an unstable situation for you! 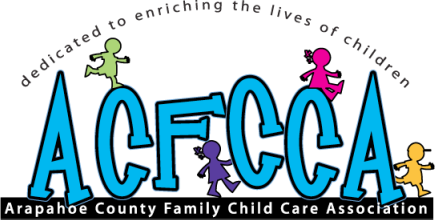 As you begin your search for child care, we, Arapahoe County Family Child Care Association urge you to consider the following questions which need to be answered to your satisfaction as you interview licensed child care providers. The first list of questions are ones you should consider asking as these questions do have a correct answer. The second list of questions are points for you to consider if they cover IMPORTANT ISSUES for you. You need to determine the right or wrong answers as they apply to your individual situation. These lists, by NO means, are complete but may offer you a starting point to help you have a successful search for a LICENSED CHILD CARE HOME for your child/ren and yourself. Are you licensed? May I see your license? All in-home child care providers are required to post their license in a prominent location for all to view. This is to show that the providers home has been inspected for safety and the provider has met the required guidelines. Do you have a current Child-Infant CPR/First Aid Certificate? This is a requirement. All licensed providers must take the renewal training every 2 years. Do you have any child care training? Are you continuing your education? A 15 hour pre-licensing class is required to become licensed, and on-going training is required. Are you planning to stay in Child Care long term? Children need a stable environment and a stable provider they can bond with. Do you have child protective gates? A fenced play area? All these are licensing requirements. These are to protect your child, and are also licensing requirements. Do you have a designated sick room? What do you do if my child/ren become ill? This is to protect your child from spread of disease. Do you have emergency numbers posted in handy locations? This is a licensing requirement and is a good idea, to enable you, and most importantly your child/ren to know how to exit the home in case of fire. Do you have FIREARMS and are they locked away from the children? A licensing requirement and GOOD COMMON SENSE! Do you have a fireplace/wood stove? Do you use it during child care hours? A fireplace/wood stove may be used ONLY if it is surrounded by a safe fence of some sort. The following questions are merely guidelines which you may or may not choose to consider. Some of these questions may be used during your telephone interview and may help you determine if you wish to pursue the further interviewing of a particular provider. Do you transport children? Will my child/ren ever be in your vehicle? Do you have car seats available or do we haveto supply one? Do you transport to school, which ones? Do you have pets? What kind? Are they vaccinated? How long have you been licensed? How many children are presently in your care? How long have these children in your care been with you? May I visit anytime, UNANNOUNCED? Do you have a contract? House rules? Parent Policies? What kind of arrangements do you have in case you are unable to provide care? Have you ever had a validated complaint with Human Services? What are your fees and required payment schedule? Do you ever leave the children in someone else's care? May I have references? May I contact someone who is no longer in your care? What meals do you serve? May I see a menu? Do you participate in a USDA Child Care Food Program? Do you have a daily schedule? Do the children watch television? What types of programming do they watch? Do you celebrate any Holidays? Which ones and how? Which are you closed for? Are you a member of a child care association and or support group? Do you have children of your own? Does your family assist you with the daycare? Why did you choose child care as your profession? What do you feel is your strongest point as a licensed child care provider? What makes your child care home special? needed. Our referrals are set up to assist you as much as possible in finding that perfect caregiver. Copyright 2014 Arapahoe County Family Child Care Association. All rights reserved.